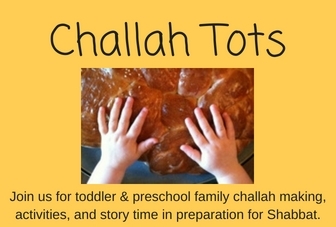 OCTOBER 19 (11am – 12pm) Toddler and preschool family challah making, activities, and story time at Temple Sinai (509 Broadway, Saratoga Springs). Come sing songs, hear a story, do a craft, and MAKE CHALLAH together for Shabbat with Rabbi Jonathan! Geared for families with kids infant‐5yr.